Vespa became a global phenomenon thanks to the Primavera 150, which is still a great icon of style and high technology. TOURING SPECIAL SERIES: The Touring Special Series gives a nod to the thousands of specially outfitted Vespas that have carried entire generations on tour all over the world. The finishes are designed to spice up the Vespa's compact and rigid body: the standard chromed luggage racks at both front and rear considerably increase the vehicle's load carrying capacity, while the rounded and transparent fly screen wraps round the Vespa "eye" to raise the level of protection. 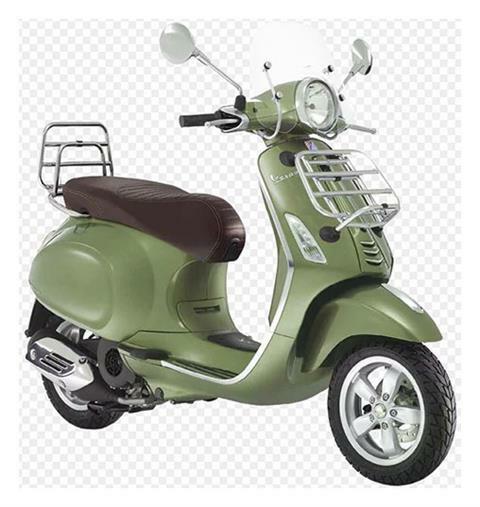 The saddle, made of last generation materials, makes the Vespa look even more elegant but what really highlights the classic style of the legend and enhances its compactness is the colour of the plastic side elements encasing the lower part of the vehicle, in tone with the body itself. The Vespa Touring comes standard with the agile side kickstand, the handiest solution for parking, and is unmistakable with the “Touring” wording on the vehicle’s glovebox.